The cottages at Lakshman Sagar are divided into two clusters, with six 900 sq ft cottages on either side of the lake. All the rooms are nestled in the natural topography of the land and have taken to the contours of the hills; making them similar but not identical to each other. With a strong influence from the neighbouring village culture and life, all the elements found in the rooms have a story to tell. Each room opens into a private splash pool overlooking the lake, creating a visual bliss with a panoramic view of the landscape. In the bathroom grey slate walls have been polished with lacquer used by local wood-smiths to shine furniture, while bathroom sinks and private plunge pools in each room have been carved out of rough granite rescued from local mining sites. 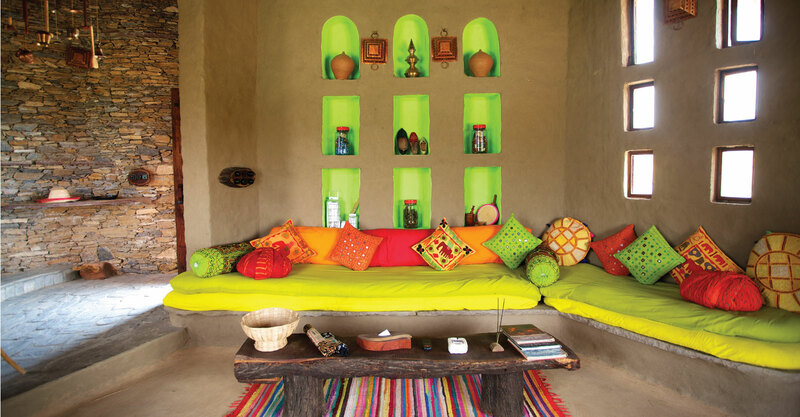 The interiors are brightly decorated with local influences creating an experience of the nuances of village life. From a large wind chime installation of brass vessels like lotas (pots), belans (rolling pins) and mathinis (butter churners) to a jalaebi patal (wok) as a key holder and a shoe cleaner from mini brooms, the interiors reflect the local culture.